Justice Ranjan Gogoi was administered the oath of office by President Ram Nath Kovind at Rastrapati Bhavan. He would retire on November 17, 2019. Justice Ranjan Gogoi has been sworn in as the 46th Chief Justice of India. 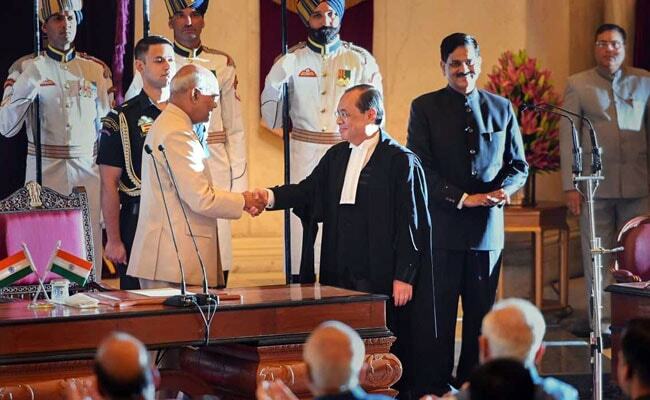 Justice Ranjan Gogoi was sworn in as the 46th Chief Justice of India today. He succeeds Justice Dipak Misra who retired on October 1. Known to be soft-spoken but tough judge, 63-year-old Justice Gogoi is the first person from the northeast to become the Chief Justice of India. He was among the four judges who, in January, criticised Chief Justice Misra in a rare press conference and accused him of misusing his role of assigning cases as the Supreme Court's Master of the Roster. Madhya Pradesh Chief Minister Shivraj Singh Chouhan wrote, "Wishing Shri Justice #RanjanGogoi best wishes on assuming the responsibilities as the Chief Justice of India." Wishing Shri Justice #RanjanGogoi best wishes on assuming the responsibilities as the Chief Justice of India. Odisha Chief Minister Naveen Patnaiak tweeted, "Congratulate Justice #RanjanGogoi on swearing in as the 46th #ChiefJustice of India. His scholarship and vast repertoire of experience will benefit India immensely. Wishing him the very best for a fulfilling tenure." Congratulate Justice #RanjanGogoi on swearing in as the 46th #ChiefJustice of India. His scholarship and vast repertoire of experience will benefit India immensely. Wishing him the very best for a fulfilling tenure. Union Minister Harsimrat Kaur Badal wrote, "Congratulations Justice Ranjan Gogoi for being sworn in as 46th Chief Justice of India. May Waheguru be by your side as you proceed with the responsibilities of this august office.#RanjanGogoi"
Congress spokesperson Abhishek Singhvi also congratulated him saying, "#RanjanGogoi is among those 11 judges of the Supreme Court who voluntary declared and made their assets public. He owns no house. A truly deserving example of disclosure & transparency to be emulated." A user from Assam tweeted, "Welcoming someone from my very own Dibrugarh , my wishes are with you Sir, we hope you shall continue to deliver justice and unbiased judgments for a proggressive India." Another tweeted, "Historic day for #Assam , Justice Ranjan Gogoi to take oath as #CJI ... congratulation #RanjanGogoi sir." Justice Gogoi was administered the oath of office by President Ram Nath Kovind at Rastrapati Bhavan. He would retire on November 17, 2019.